Processing orders in Shop-Script means executing various actions on them. You may use default actions or also add your custom ones. Confirms that you have received an order and are ready to accept payment from a customer and to deliver ordered items. If “Settings → Stocks → Update stock” setting is set to “Order was confirmed and accepted for processing”. If “Settings → Stocks → Update stock” setting is set to “Order was placed” and the “Processing” action is executed on an order in “Refund” status. Cancel processing of an order; e.g., if it’s a fake or test order. Loyalty bonuses received for a paid order are deducted from a customer’s account. If “Settings → Stocks → Update stock” setting is set to “Order was placed” or “Order was confirmed and accepted for processing” and if stock quantities of ordered products and SKUs have been reduced during previous order processing, and if the “Delete” action is executed on an order not in “Refund” status, then stock quantities are restored. Payment date of a paid order is cleared. Sales reports data are re-calculated. Customer’s total purchases’ amount is re-calculated. Mark an order as paid to confirm to a customer that you have received their payment and so that your other staff knows that an order is ready for delivery. Loyalty bonuses are added to a customer’s account. If “Settings → Analytics → Transaction date” setting is set to “Order was marked as paid or completed”, then current date is saved as order payment date; otherwise, order creation date is saved as the payment date. If “Settings → Stocks → Update stock” setting is set to “Order was confirmed and accepted for processing” and if stock quantities of ordered products and SKUs have not been reduced during previous order processing, then stock quantities are reduced. Mark an order as delivered to a customer so that your staff knows that it’s time to prepare finalizing documents for an order to be completed. When this action is executed, there is an option to enter a tracking ID for yourselves and a customer to be able to track the delivery status. If “Settings → Stocks → Update stock” setting is set to “Order was placed” or “Order was confirmed and accepted for processing” and if stock quantities of ordered products and SKUs have not been reduced during previous order processing, then stock quantities are reduced. Execute this action on a paid and delivered order to remove it from the list of not yet completed orders. If “Settings → Stocks → Update stock” setting is set to “Order was confirmed and accepted for processing” and if “Mark as Completed” action is executed on an order in “New” status, then stock quantities are reduced. Execute this action if a customer has requested their money back and you agree to do so. Order status will be changed to “Refund”, and your staff will know that they may, and must, prepare documents required for an order refund in your organization. Online payment can be returned to a customer if “Actual refund” option is enabled when this action is executed. Order payment date is cleared. If “Settings → Stocks → Update stock” setting is set to “Order was placed” or “Order was confirmed and accepted for processing” and if stock quantities of ordered products and SKUs have been reduced during previous order processing, then stock quantities are restored. Change order status back to the one it had before deletion. Previously canceled loyalty bonuses are restored. Previously cleared payment date of a paid order is restored. Stock quantities of ordered products and their SKUs are reduced if they have been reduced during previous processing of an order before it was deleted and if “Restore” action is executed on an order in a status different from “Refund”. To execute an order action, click its button on the order-viewing page in “Orders” section. Change any data related to a customer, including their address and name, to ordered items, and to the order in general, such as discount, shipping and payment methods. Edit shipping tracking ID and courier delivery date and time. Send messages to a customer whenever you require additional information on an order or to update a customer on the current order status. Messages can be sent by email or as text SMS. The latter is possible only if a telephone number is specified in a customer‘s profile and you have set up connection to an SMS provider. To execute these additional actions, use links on the right. A link to execute this action is located at the bottom of the order contents viewing area. Click it and type a message for yourself or a colleague of yours. It will not be visible to a customer. It’s a system action, which cannot be executed manually by a user. It is executed automatically when a payment gateway sends a special request to your online store; e.g., to update an order’s status. Information about its execution is stored in the order processing history. If you implement a complex workflow for processing orders in your online store, you may need to set up custom actions in section “Settings → Order states” using “Add action” link. Read more about creating custom order actions. Upon execution of an order action a log record is added to the order history block at the bottom of the order-viewing page. It is useful to handle various special cases when processing orders. Most actions change the order status. For example, action “Processing” change order status from “New” to “Processing”. Some actions do not; e.g., “Contact customer” and “Add comment”. For your custom actions set up in “Settings → Order states” section you are free to define whether they must or must not change the order status. 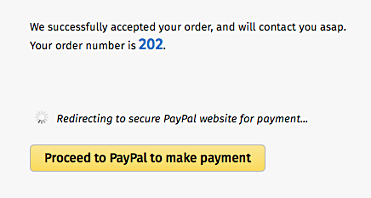 For each order status you can decide whether an order in that status can be paid for in the customer online account. If online payment is marked as available, then a button to pay for an order is visible on the order-viewing page. When the payment option is enabled in the “New” status, then your customers can pay for their orders right after the checkout is completed. If it is important for to check every order before a customer can pay for it, enable “customers can pay for orders in this state in their personal accounts” option only for the status to which you will transfer orders after approval. For example, you may disable this option for all statuses except for “Confirmed” or any of your custom statuses; e.g., “Approved”. When the payment option is disabled in some of the statuses, then customers will see a message instead of the payment button, which you can edit in the provided text field.